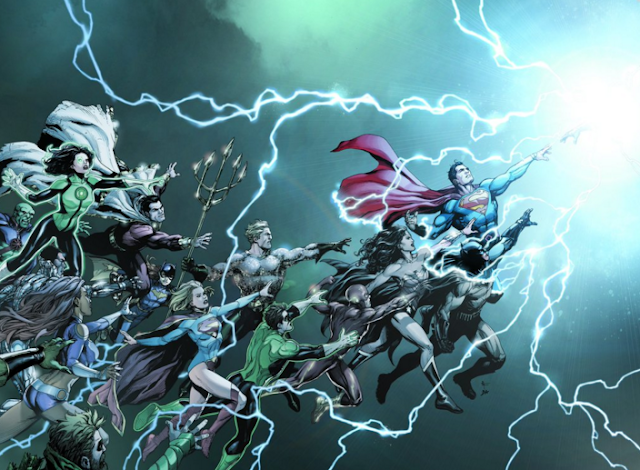 "DC Universe: Rebirth" one-shot by DC Chief Creative Officer Geoff Johns with art by Gary Frank, Ivan Reis, Phil Jimenez and Ethan Van Sciver available May 25. 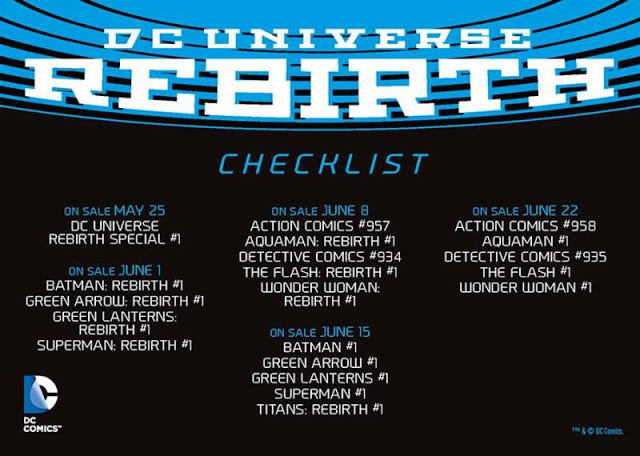 On Saturday morning, Dan DiDio, Jim Lee and Geoff Johns announced the mysterious and much-anticipated details of DC Comics relaunch (don't call it a reboot) called "Rebirth." 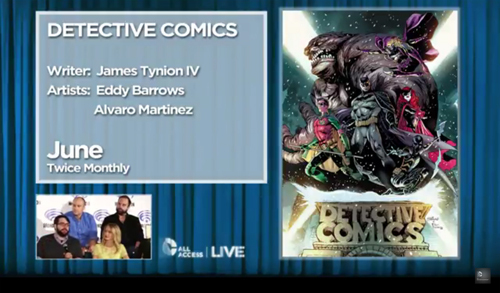 During the panel at this year's Wondercon, the publisher's brass along with DC All Access host Tiffany Smith introduced the new creative teams on stage for an interview about the new storylines for their respective books. 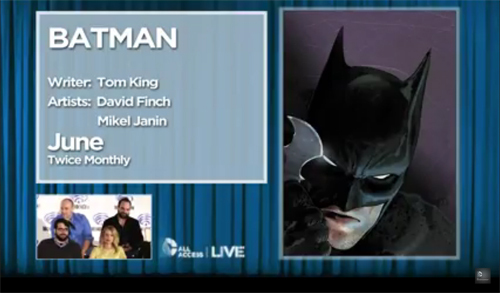 You can see the entire presentation in the player below as it was live streamed to the world on DC Comics blog page. The continuity of the current books that will be part of the relaunch will remain intact but begin with new #1s as 17 books will go bi-monthly and 14 will be monthly with the price point of $2.99. The Bat-family of books gets a new book with an old friend. 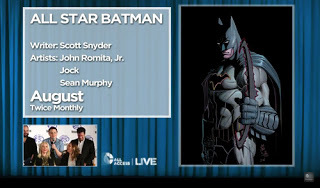 "All Star Batman" will feature the longtime series writer Scott Snyder, with art by John Romita Jr., Jock, Sean Murphy, Afua Richardson and more artists to be named. It ships twice monthly starting in August, and will feature many of the classic Bat-villains. Snyder leaves his acclaimed run on "Batman" in good hands. "Batman" will be written by Tom King, with art by David Finch and Mikel Janin. It will ship twice monthly, beginning in June. "Detective Comics," will be returned to its original numbering, will be written by James Tynion IV, with art by Eddie Barrows and Alvaro Martinez. It will ship twice monthly starting in June. "Nightwing," will be written by Tim Seely, with art by Javi Fernandez and Marcus To. It ships twice monthly beginning in July. 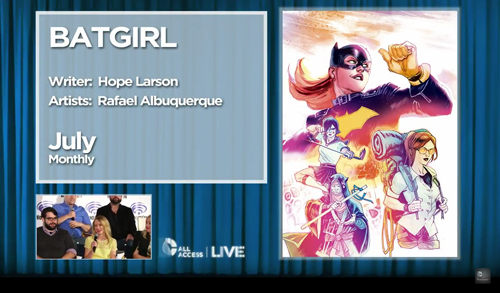 "Batgirl" will be written by Hope Larson, with art by Rafael Albuquerque. It ships monthly beginning in July and will be Larson's first superhero work in comics. "Batgirl & The Birds of Prey" will be written by Julie Benson and Shawna Benson, with art by Claire Roe. It ships monthly beginning in July. 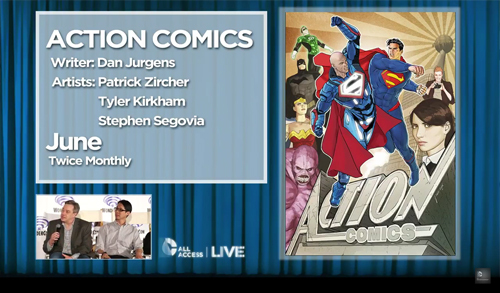 "Action Comics," will return to its original series numbering and be written by Dan Jurgens w ith art by Patrick Zircher, Tyler Kirkham, and Stephen Segovia. It ships twice monthly, starting in June. "Superman" will be written by Peter Tomasi and Patrick Gleason, with art by Gleason and Doug Manke. It ships twice monthly, beginning in June. "New Super-Man" will be written by Gene Yang and drawn by Viktor Bogdanovic. 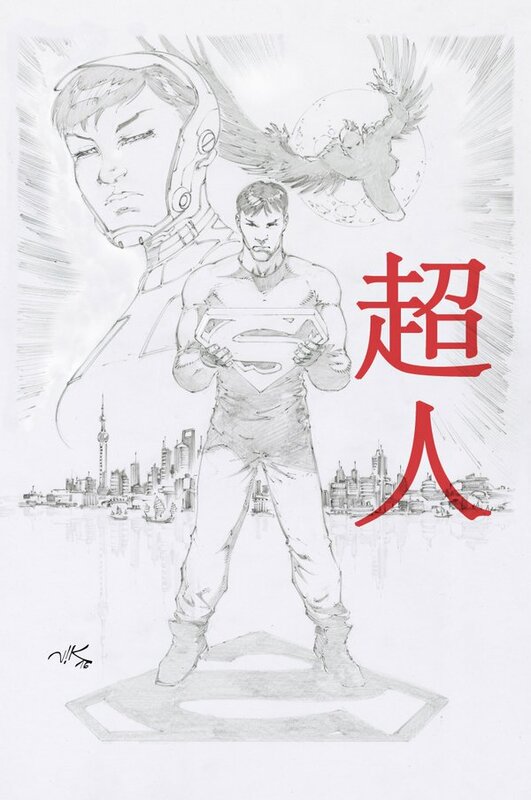 It stars a new young character set in Shanghai who becomes receives the powers of Superman and becomes a hero. "Supergirl" will be written by Steve Orlando with art by Brian Ching, and ships monthly beginning in September. Supergirl will be up against the Kryptonian Cyborg, who is revealed to be Kara's father. This part got a mixed reaction from those in attendance. "Trinity," starring DC Comics' marquee heroes Superman, Wonder Woman, and Batman, will be written and drawn by Francis Manapul, with additional art by Clay Mann. It will ship monthly starting in September. "Superwoman," a new character, will star in a book written and drawn by Phil Jimenez, with additional art by Emanuela Lupacchino. It will be released monthly starting in August. 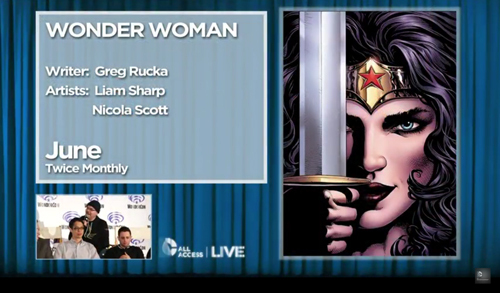 "Wonder Woman" marks the return of Greg Rucka to the series and will be drawn by Liam Sharp and Nicola Scott. It ships twice monthly beginning in May, and with Sharp illustrating contemporary adventures, and Scott providing "Year One" stories. 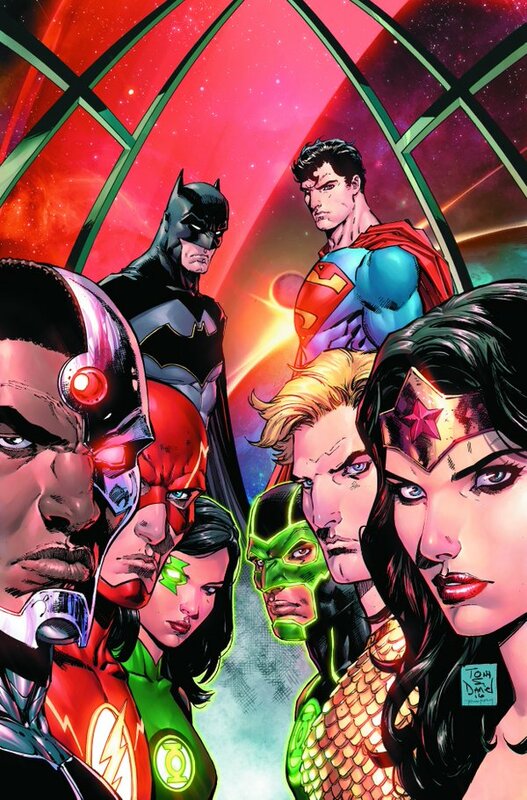 "Justice League" will be written by Brian Hitch, with art by Tony Daniel and Fernando Pasarin. It will ship twice monthly beginning in June. "The Flash" will be written by Joshua Williamson, with art by Carmine Di Giandomencio and Neil Googe. It ships twice monthly beginning in June. 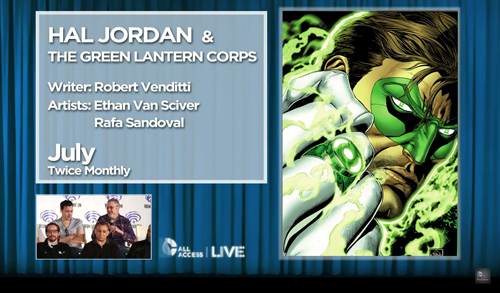 "Hal Jordan & The Green Lantern Corps" will be written by Robert Venditti with art by Ethan Van Sciver and Rafa Sandoval. It ships twice a month beginning in July. 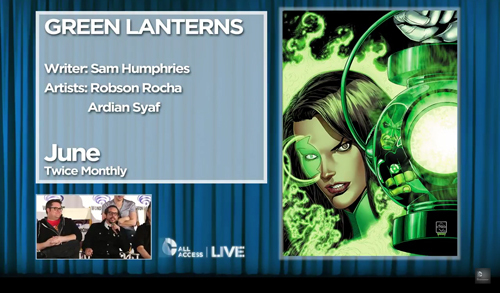 "Green Lanterns" will be written by Sam Humphries with art by Robson Rocha and Ardian Syaf, and ships twice monthly beginning in June. "Cyborg" will be written by John Semper, who moves from animation to comics, and drawn by Will Conrad and Paul Pelletier. It ships twice monthly beginning in August. "Aquaman" will be written by Dan Abnett and Brad Walker, with art by Walker, Jesus Merino, and Phil Briones. "Titans" will be written by Dan Abnett and drawn by Brett Booth. It ships monthly beginning in July. "Green Arrow" will be written by Ben Percy with art by Otto Schmidt and Juan Ferreyra. It ships twice monthly beginning in June. 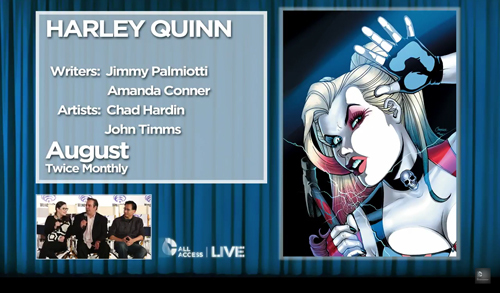 "Harley Quinn" will be written by Jimmy Palmiotti and Amanda Conner, with art by Chad Hardin and John Timms. It ships in August, twice monthly. "Suicide Squad" will be written by Rob Williams, with art by Jim Lee and Philip Tan. It ships in August, twice monthly. The team consists of Killer Croc, Harley Quinn, Katana, Deadshot, Flagg, with more members to be announced. "Red Hood & The Outlaws," shipping in August, will be written by Scott Lobdell with art by Dexter Soy. Bizarro and Artemis will join Red Hood for what Johns described as a "dark trinity." "Deathstroke" will be written by Christopher Priest, with art by Carlo Pagulayan, Igor Vitorino, and Felipe Watanabe. It ships twice monthly, beginning in August. In "Teen Titans," written by Ben Percy and drawn by Jonboy Meyers, ships in October, and sees Damian Wayne trying to lead the Titans. "Batman Beyond" will be written by Dan Jurgens with art by Bernard Chang. It ships monthly beginning in October and sees the return of Terry McGinnis. "Blue Beetle" will be written by Keith Giffen with art by Scott Kolins. It ships in September and unites Jaime Reyes with Ted Kord. "Hellblazer" will be written by Simon Oliver with art by Moritat. It ships monthly beginning in August. "Super Sons," starring the sons of Superman and Batman, ships in September, creative team to be announced later. "Justice League of America" will ship twice monthly beginning in September, creative team to be announced later.